Dorothea, the quietest, most charming weed-smoking grandma in the video that blew up the internet this week, apparently didn't have as much fun as her compatriots did getting stoned for the first time. In an interview with ANIMAL, director Mike Gaston said that Dorothea—who sat in the middle and had a distinct Rose Nylund vibe—told him it's unlikely she'll ever smoke again, but not because it was too intense: "She actually expected it would be more like an acid high." TMZ interviewed Dorothea herself, who said that despite the surprising high, the experience convinced her that pot should be legalized. The hardest part of the project, according to Gaston, was finding three grandmas who had never toked up even once. The first thing we thought was, "Let's call our grandmas." Well, it turns out that all of our grandmas have smoked weed. Then we're like, "So, let's ask our friends' grandmas." They too have smoked weed. After asking tons of peoples' grandmothers whether or not they had smoked weed, we finally had go to a talent agency. Even then it was difficult! We'd meet grandmas who'd claimed they'd never smoked weed, but after just a little bit of grilling, it was clear that they had, but like 40 years before. 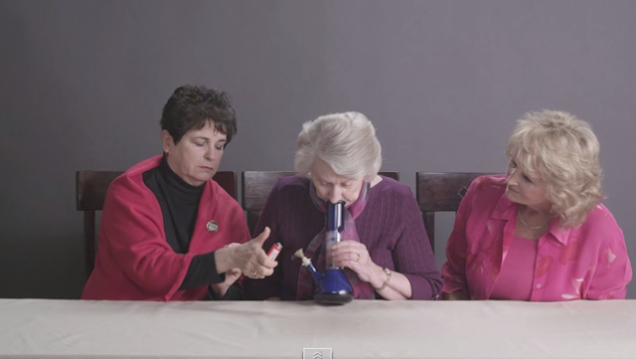 We finally got two grandmas that were perfect, who had never smoked weed before. The third one was actually the mom of one of the directors of [a talent agency], because it was so hard finding someone who never smoked weed. Paula, the most gung-ho grandma—in the video, she urges her fellow smokers to hit the bong "like you mean it"—told Gaston she definitely plans to get stoned again.